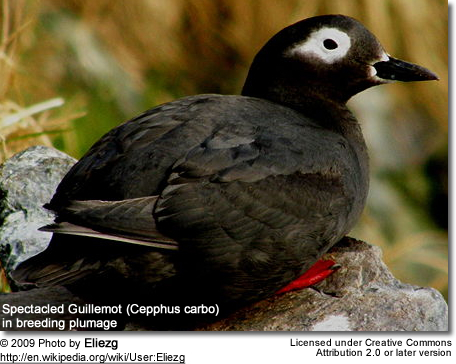 The Spectacled, or Sooty Guillemot (Cepphus carbo) is a member of the auk family. It occurs in the northwestern Pacific Ocean: throughout the Sea of Okhotsk and the Kuril Islands in Russia and on the northern island of Hokkaidō in Japan. This seabird measures about 38 cm (15") long, including its tail. It has red legs, a black bill and blackish eyes. TheSpectacled Guillemot's breeding adult is mostly plumaged dull sooty-black except for distinctive white 'spectacles' on the face. In the non-breeding plumage, the plumage below is white, tipped very pale grey-brown. The transitional plumage is scaled scaled with white on the underside.